Effect: Four Chinese coins pass one by one from one hand to the other! In this package you will find one finely crafted gimmicked coin shell produced by Tango Magic. Q. Just checking. This included the shell and the matching Chinese coin? A. No, this is only the SHELL. 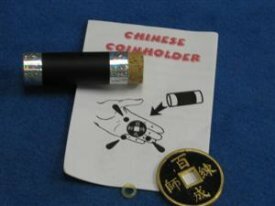 You will have to provide your own Chinese coin.